This recipe comes to us from Val Lochner, a co-worker of mine. I have had these before at various venues, but could never land the recipe until now. 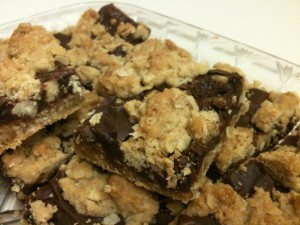 It is a soft chewy oatmeal bar mixed with a sweet, tasty chocolate filling. Just flat out AWESOME!! Val, when you bringing in more? Love it! Cream butter and sugar until light and fluffy. Mix in eggs and vanilla. Sift together flour, soda, and salt. Stir in oatmeal. Add dry ingredients to creamed mixture. Set aside. To make filling, mix chips, condensed milk, butter, and salt; melt over low heat. When smooth, add nuts and vanilla. Spread 2/3 of oatmeal mixture in a 10 x 15 (or half-sheet, 13 x 18) pan. Cover with chocolate filling. Dot with remaining 1/3 of oatmeal mixture.